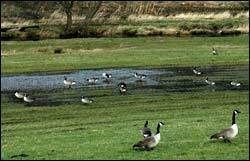 A medium to hard walk of about 5 miles, taking about 3 hours and including some steep paths. Churn Milk Joan is a local landmark and subject of a Ted Hughes poem. 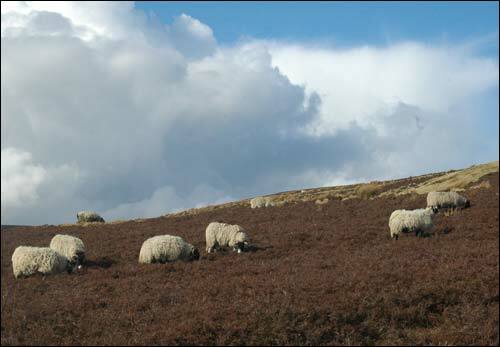 If in doubt, follow the signs, but take care, as the weather on the 'tops' can be much colder and wilder than at the valley bottom. On the Manchester platform, take the cycle-path to the east with the railway line on your left. 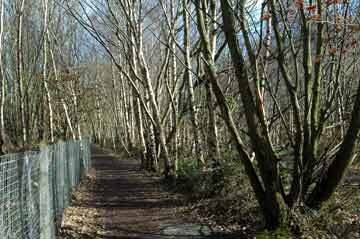 You walk along the path for nearly a mile, through a newly forming wood of young birches. 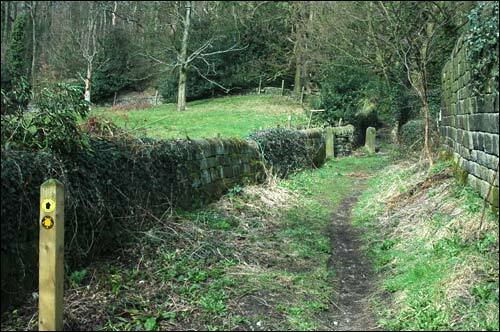 Above: the path approaches the bridge at Brearley. Follow the path over the railway. Coiners commemorative stone just after the bridge. 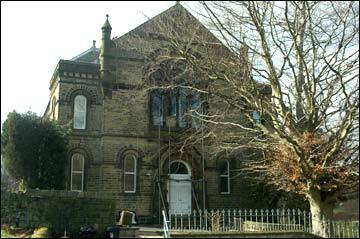 Continue east, passing Brearley Chapel (1873). About 50 yards after the chapel, turn sharp left over the river. 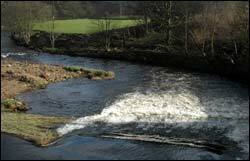 At this point, you will see a sign saying that Mytholmroyd is one mile. Views from the bridge as you cross the river. 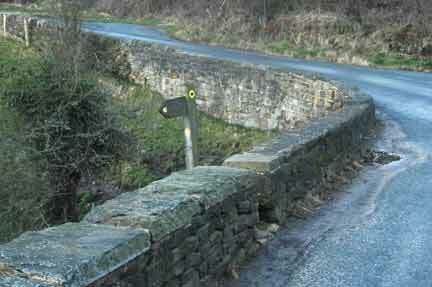 Turn left over the river and canal (Brearley Lane) and up to the main road. Cross straight over the busy A646, and immediately opposite (i.e. 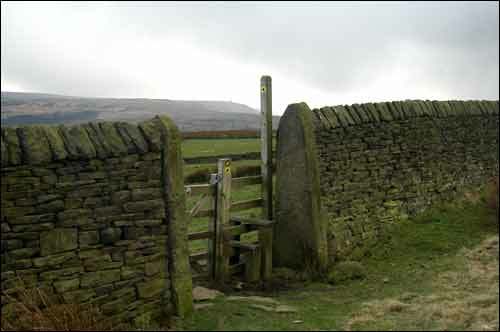 straight on) is Brearley Lane Top. Follow the waymarked signs up the steep footpath. 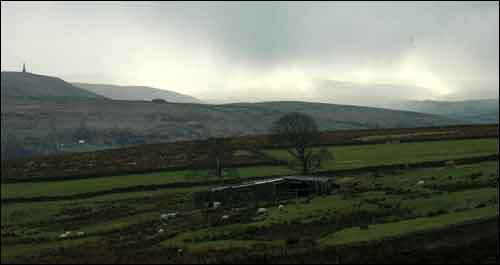 straight up the hill, heading north-west through and then beside the wood, with causey stones some of the way. 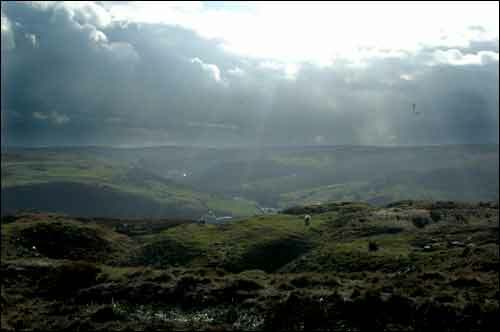 After a while you will see an open field to your left with a view across Mytholmroyd. Watch carefully for the sharp turn right just after this field (look out for the waymark sign). Follow this up a very small flight of steps. 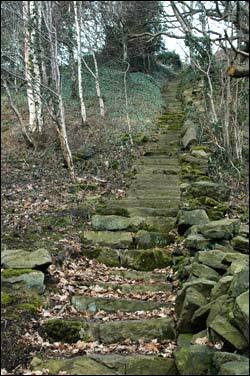 Continue up through the woods to find a steep run of 100 stone steps (above right) which comes out nearly at the top of Midgley Road, and a most welcome bench. 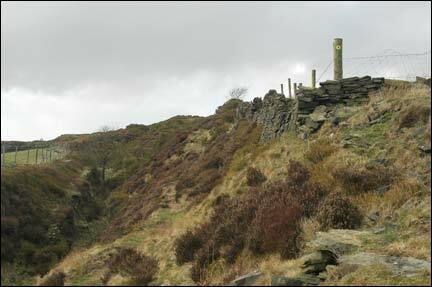 Although the views are a little obscured by the trees which must have grown since the bench was put in place, you have now completed the steepest part of the walk. This will have taken about 45 minutes to this point. 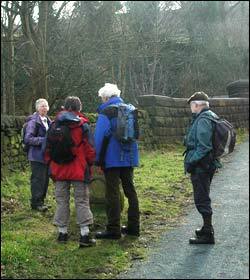 Now walk towards Midgley - turning right, and as you enter the village. Very soon you will see the old Lord Nelson. 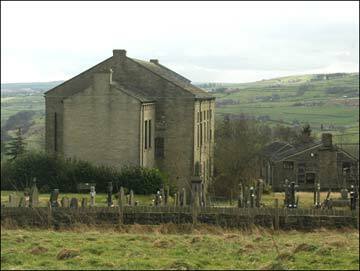 Turn immediately left into Chapel Lane keeping the old methodist chapel on your right. 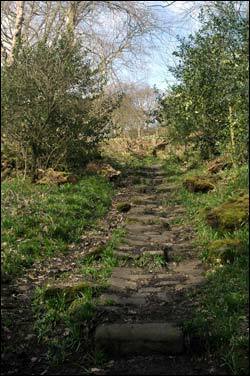 Turn left by some stables, and follow a path which runs along the side of (and above) an old sunken way. The path to take is in the middle of this photo, just below the waymarked sign. 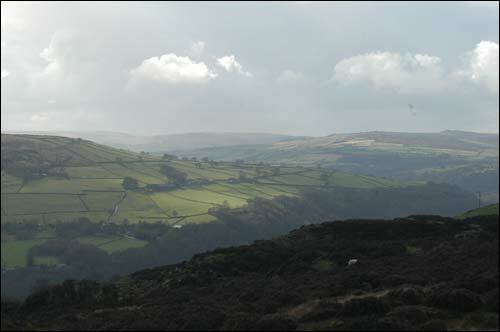 You are now way above the valley, with a crumbling dry stone wall and sheep to your right, there are spectacular views of Cragg Vale, Scout Rock, Mytholmroyd and Stoodley Pike on the left. Even on a Sunday afternoon, you will not see many other people. 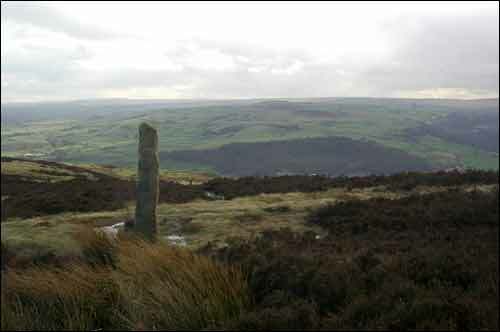 Head north very shortly, turning left onto the Calderdale Way across Midgley Moor. It's quite easy walking from here on. Some great views at this point of the walk. 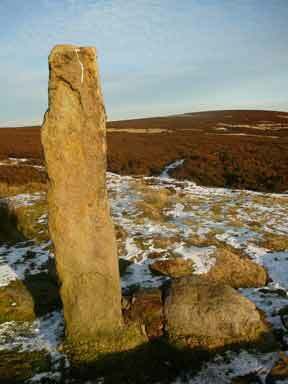 A tall stone, Churn Milk Joan, will soon come into view. Churn Milk Joan dates from about 1600 and was probably erected to settle a boundary dispute. 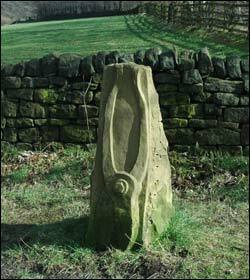 Ted Hughes commemorates this stone in one of many poems reflecting on childhood folk tales. 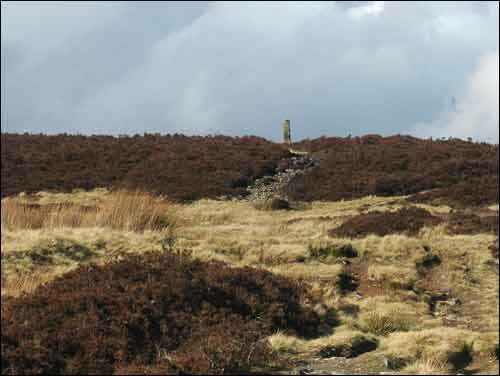 Follow the local custom for good luck by putting a coin or two in the hollow at the top of the stone, taking away coins left by earlier walkers. 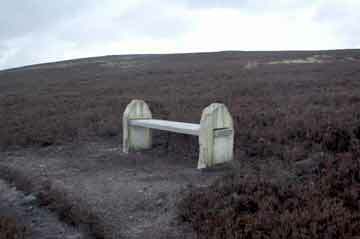 A few yards to the west from Churn Milk Joan is a bench called Cranley's Seat from where you have great views of Mytholmroyd, Stoodley Pike, St Peter's Church, Sowerby and endless acres of moorland. The weather can change very quickly. 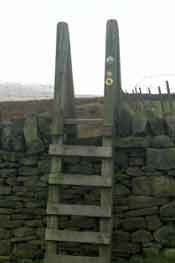 Continue west on the Calderdale Way across the moor for a short way, before taking the ladder stile to your left into a moorside pasture. 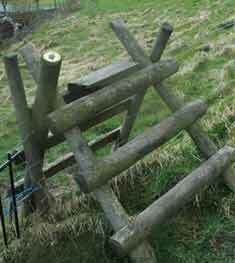 Continue over further ladder stiles and then across open country until you arrive at the back of Wicken Hill Farm. Follow the path round the farm and down the track to Heights Road. On Heights Road, turn right for a short while, taking the first footpath sign on your left, which heads south east and drops down onto Raw Lane. Turn right along this track, soon picking up a footpath on the left. Head downhill through Hill House Wood, then Red Acre Wood. 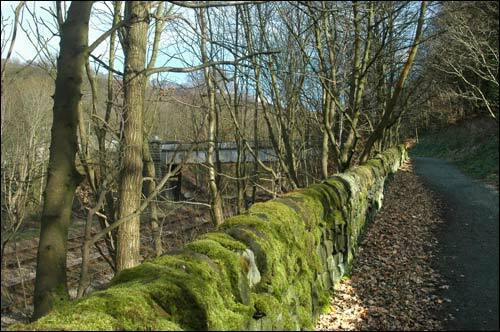 At the bottom of the hillside, still in the woods, follow the path to the east, keeping the sewage works on your right. 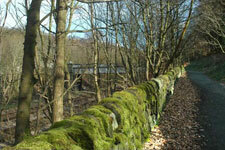 Leave the woods at Redacre Bridge and return to Mytholmroyd.